This is one of the easier recipes I’ve done in a while, a dish to make on a busy weeknight that comes together in about the same time it takes to make the steamed rice that goes along with it. 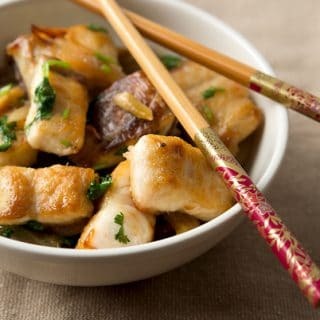 It’s total Vietnamese comfort food: Crispy pieces of fish bathed in a simple sauce, served with onions, chiles and lots of cilantro. I first found this recipe in my friend Andrea Nguyen’s great book Into the Vietnamese Kitchen: Treasured Foodways, Modern Flavors. She uses catfish for her version, but I prefer a firmer fish such as lingcod. Virtually any fish will work here, however. 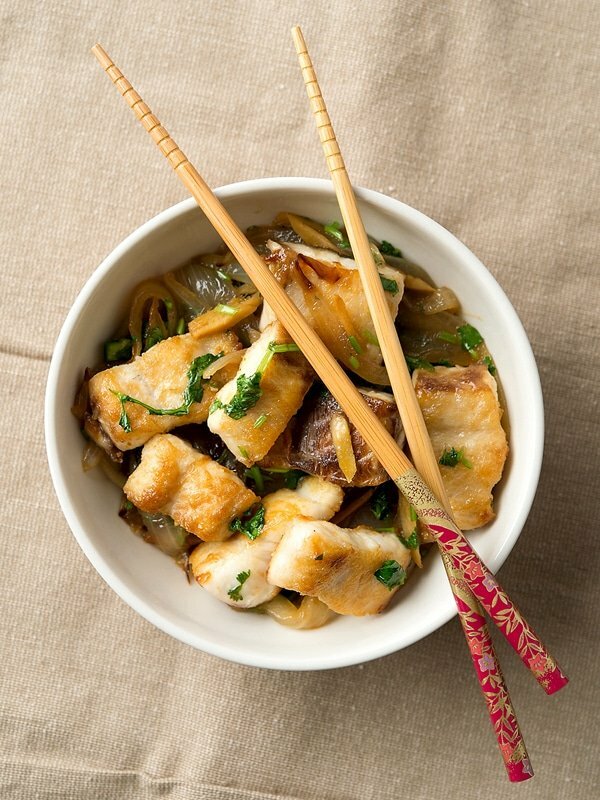 The key to success with this dish is not overcook the fish. The easiest way to achieve this is to get just one side of the fish crispy, letting the simmering sauce cook the rest of the fish gently. You can of course sear both sides if you want, but if you do, make sure you are really searing it quickly, over high heat. Don’t like cilantro? Use mint or watercress, or even parsley, although parsley’s not used much in Vietnamese cooking. And yes, I know this is not a very challenging recipe. No fish skin chicharrons or crispy fried duck tongues here. Just wanted to let you know that I can do easy, too. Cheers! I normally use a wok to make this recipe, but a deep-sided saute pan or frying pan is just as good. You can use any fish here, but I prefer a lean, white fish. Good choices would be lingcod, Pacific rockfish, tilefish, walleye, yellow perch, catfish, red drum, cobia, sturgeon, striped bass, haddock... you get the point. 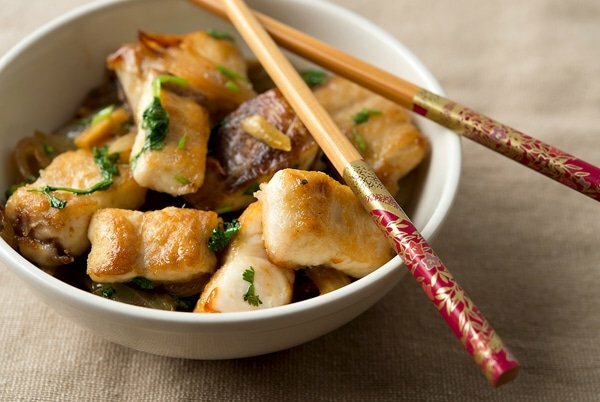 Serve this with simple steamed rice and you have a great weekday dinner. Sprinkle salt over the fish. Heat the peanut oil in a large saute pan or wok and add the fish. Sear the fish in the oil so one side of it gets a nice, golden brown crust. Don't flip the fish, as you will finish cooking it later. Remove each piece of fish as it browns. When all the fish is done, add the onions and ginger and a little more oil if needed. Stir-fry over very high heat until the edges of the onions begin to brown, about 3 minutes. Add the sugar, jalapeno chiles, fish sauce and water and bring to a boil. Add the fish and gently toss everything to combine. Cover the pan and simmer for 5 minutes. Gently mix in the cilantro and turn off the heat. Add the lime juice and serve with steamed rice. Thank you Hank. I am not a great cook and stumbled my way through this easy recipe making some mistakes as I went. My hopes weren’t very high when I was done, but when I tried it I was almost unsettled by how amazingly delicious it was. Truly great flavor and I know I will make it even better next time. Thanks again. This is amazing. I was a foolishly afraid of the ginger, jalapenos, and cilantro… This is just so good. I’ve made it with Lingcod, larger rockfish, and Halibut. Just killer.